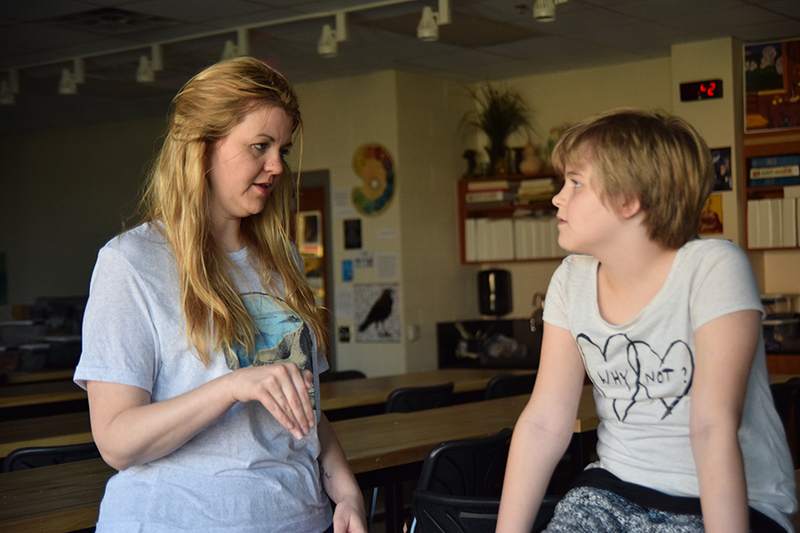 Art teacher Amanda Beller talks with her daughter, Lane, during eighth period. Amanda and her husband, Justin, said they have been intentional about providing their children first-hand experiences with social justice issues. The airport was crowded with bodies and the air filled with screams. The crowd held clutched signs with capital letters, chanting the words passionately. They struggled to find footing in the marked area bordered with police. Visitors from all around the world watched as they filled the air with screams and bodies. 10-year-old Lane Beller watches protesters at the Dallas-Fort Worth International Airport on Saturday, Jan. 28. Among the crowd were AP art history and studio art teacher Amanda Beller, her husband Justin, and their 10-year-old daughter Lane who tried to find a spot to stand. It wasn’t where they expected to be on a Saturday night. 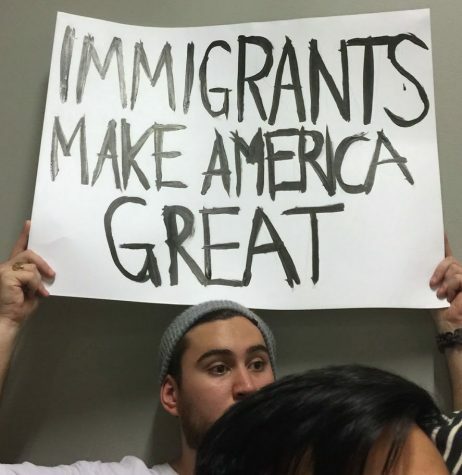 An estimated 2,000 protesters gathered at the DFW airport on Jan. 28 as travelers flew in from all around the world following President Donald Trump’s executive order that temporarily banned immigrants and travelers from Iraq, Syria, Iran, Sudan, Libya, Somalia and Yemen. Beller had no plans that night until Justin texted her about a tweet he had seen regarding the protest. He was having dinner with Lane who told him she wanted to go. “I said I wanted to go because I’ve never been to a protest before, and I was curious to what it was like,” Lane said. Amanda said she believed taking Lane to the protest would be a learning experience. Amanda acknowledged that family get-togethers at protests aren’t something many parents consider. Lane said she knows what it means to join protesters. “[Attending the protest] meant you were helping out, and you were helping these people get out and making a difference,” Lane said. Lane asked Amanda several questions brought up by political cardboard signs and conversations. Amanda explained to Lane why they want to speak out and that the First Amendment allows them to do so. Amanda said the international airport was a relevant venue because people from other countries entered America hearing welcomes from citizens. A protester makes his opinion known during the DFW airport demonstration on Jan. 28. The event had an extra peacefulness to it that was important to the protesters, Amanda said. 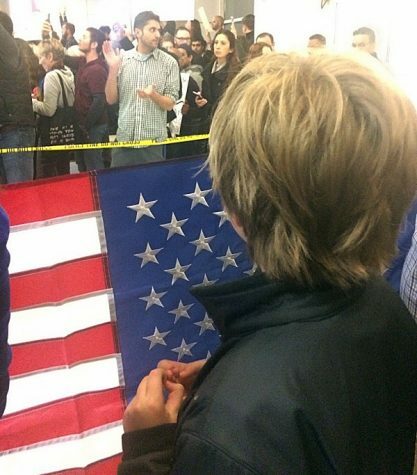 She attended Black Lives Matter protests previously which were not as peaceful as the assembly at DFW. The campus president of Young Democrats of America, junior Grant Durow, said he believes in the importance of keeping protests peaceful as protected in the Constitution. Airport employees thanked protesters for staying contained and brought them water, Amanda said. With Lane by Amanda’s side, she said she knew her daughter was safe during her experience. “I would never take my child somewhere if I thought it wasn’t going to be safe or if there was going to be violence, and there wasn’t,” Amanda said. The Bellers aren’t sure what their next outing will be. Whether it is unexpected attendance at a protest or feeding the homeless, Amanda said she will continue to raise her daughter to fight for others. I couldn’t be more proud of the YDA’s sponsor and one of my all time favorite teachers, Mrs. Beller. She’s truly an inspiration for me and so many others at Lovejoy High School, and I can’t wait to see where she goes next with her ( and now her daughter’s!) involvement in social justice movements and events in North Texas. I couldn’t agree more, Mrs Beller is a unique specimen and Im glad we’re working to keep whales safe from whaling.